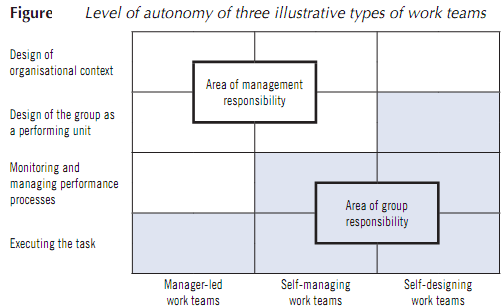 Self-designing work teams are usually found at the higher levels of the organisation such as top management teams which have also been reviewed previously in this unit. Sometimes, autonomous work teams earn the right to revise their own design (e.g. to hire new members, to alter tasks if necessary); in these instances they are a self-designing team. How well a self-designing team performs mainly depends on the team itself. So when is each of these team configurations, with their varying levels of autonomy, most appropriate? Hackman (1987) states that an organisation that chooses to form manager-led work teams is essentially betting that a manager can run things more effectively than team members can. If it is believed that the team itself can do the job better, a self-designing team would be appropriate. And if shared control over the performance situation and performance processes seems optimal, a self-managing team would be chosen. I answered "no" to both questions, as did the majority of the class. It was my initial reaction to the question and that an employee couldn't be burdened with a purchase like that.